George Graham Reviews Chris Rosser's "The Holy Fool"
The number of outstanding singer-songwriters plying their trade right now is almost overwhelming. It may have to do with a reaction against the current musical environment with so much astonishingly bad music being so ubiquitous and inescapable on the commercial media, but more and more younger artists are turning their attention to literate, thoughtful music made with mostly acoustic instrumentation. That's an almost certain guarantee for obscurity from the public eye, but a it's course taken with a clear conscience. One of the multitude of artists who has been making exceptionally fine music free from any danger of commercial fame and fortune is Chris Rosser, who has just released his first new album in three years, The Holy Fool, and it's the kind of wonderfully pleasing and engaging record that will make many a first-time listener wonder why Rosser's name has not been more prominent. Chris Rosser is based in Asheville, North Carolina, and has fairly wide-ranging musical background, starting with piano lessons with his mother from age seven, on to rock bands in high school, then to graduation from the University of Miami School of music in 1992, majoring in jazz piano and studio recording. While at Miami, he found himself drawn to contemporary folk-influenced singer-songwriters, and began to pursue that path himself. He worked for a while as a recording engineer in a studio in Charlotte before moving to Asheville with his wife to turn his full attention to his own music. After a limited-distribution independent recording in 1995, Rosser released Archeology, a very impressive CD that won one of our Graham Awards for one of the best debut recordings of 1997. Rosser's songs were memorable, lyrically substantial, and musically edifying, with his jazz background sometimes coming into play. He also produced and recorded the CD on his own, with portions made, I am told, literally in his bedroom, though its high audio standards made it sound nothing like a homemade recording. Archeology garnered a fair amount of critical praise, and Rosser has been attracting attention at various folk festivals. But it was three years before he followed up on Archology. 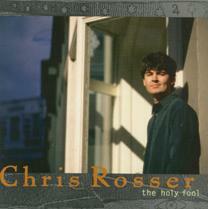 Now he has at last released The Holy Fool and it's an affirmation of Rosser's considerable talents, with more fine songs combining often-unexpected lyrics, with a tastefully eclectic musical backing. At the center remains Rosser's warm personable voice, reminiscent of the style of John Gorka or fellow North Carolina singer-songwriter and friend David Wilcox, who appeared on Rosser's last album. On The Holy Fool Rosser deftly explores topics that are a bit off the beaten paths of most singer-songwriters, including several character studies written in the third person, an appreciation of his ancestors, a musical biography of film-maker Federico Fellini, and an amusing culture clash at Christmastime. A number of the songs have a hints of a spiritual quality. As on his last album, Rosser plays most of the instruments himself, including guitars, bass keyboards and percussion, and again serves as producer, recording and mix engineer. He is joined by some added players who provide drums, dobro, violin and the more exotic instruments like tabla and dumbek, plus various backing singers including his wife Lynn Rosser and Beth Wood, a singer-songwriter in her own right. The sound of this CD is a bit more energetic than its predecessor with more use of drums and percussion. Chris Rosser's new release The Holy Fool is a thoroughly enjoyable recording by an especially talented singer-songwriter who creates memorable songs and delivers them with one of those great folk-style voices. His songs run from the contemplative to the amusing, and his blend of musical influences within his still fairly understated arrangements, is both creative and tasteful. It's the kind of album that stands out even among the current bumper crop of worthy singer-songwriters. From a sonic standpoint, the album is also a class act. Rosser's time spent as a recording engineer is evident in the CD's warmth and clarity, with the acoustic instrumentation and especially Rosser's own vocals being especially well-recorded. There is a refreshing absence of studio effects, save the infrequent use of the faddish drum machine loops here and there. There is also a much-appreciated avoidance of compression in the sound. I was beginning to think after three years following the release of Archeology, Chris Rosser was going to be one of those one-album wonders who makes a single brilliant record and then disappears. Fortunately, that is not the case with the release of The Holy Fool, a CD which is equal in quality to its predecessor. With it, I hope that Rosser begins to gain some of the recognition he so much deserves.